How to build major and minor triads ? First, you need to know how to build major and minor triads, these are two inevitable basic elements to master. You need to know that a triad, as its name implies, is a set of three notes. These three notes can be played one by one (arpeggio) or together (chord). A triad is generally made up of a root (1), a third (which can be major or minor) and a fifth (perfect, diminished or augmented). Let's discuss the third. The third determines the type of the triad, it tells us if the triad is major or minor, according to the distance between the root and the third. Indeed, if the third is spanning four semitones, we get a major third so a major triad. If it's spanning three semitones, we obtain a minor third so a minor triad. 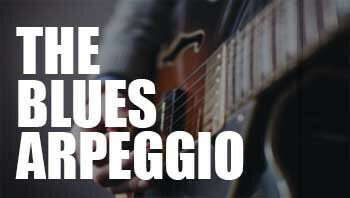 The blues arpeggio consists of the mix of a major and a minor triad. 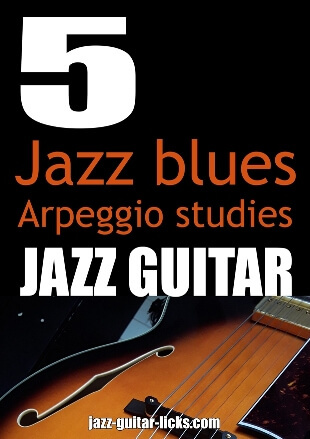 It means that the blues arpeggio contains both minor (b3) and major thirds (3). The example below shows you how to build a blues arpeggio in C. You have to try to play the blues arpeggio in twelve keys on the guitar starting from the sixth, the fifth, the fourth and the third string. First, it is recommended to practice the blues arpeggio starting from the root (1), the minor third (b3) and the fifth 5) in ascending and descending movements, thus giving six patterns. Be sure to practice them in twelve keys. All the following examples are in the key of F7. So, we get the root (F), the flat third (Ab), the major third (A) and the fifth (C). These four notes represent the F blues arpeggio. What's the circle of fifths ? Now that you are familiar with the 6 previous patterns, you can try to play them following the circle of fifths (or circle of fourths). The circle of fifths is a useful device when you want to practice scales, chords or arpeggios over the twelve keys. 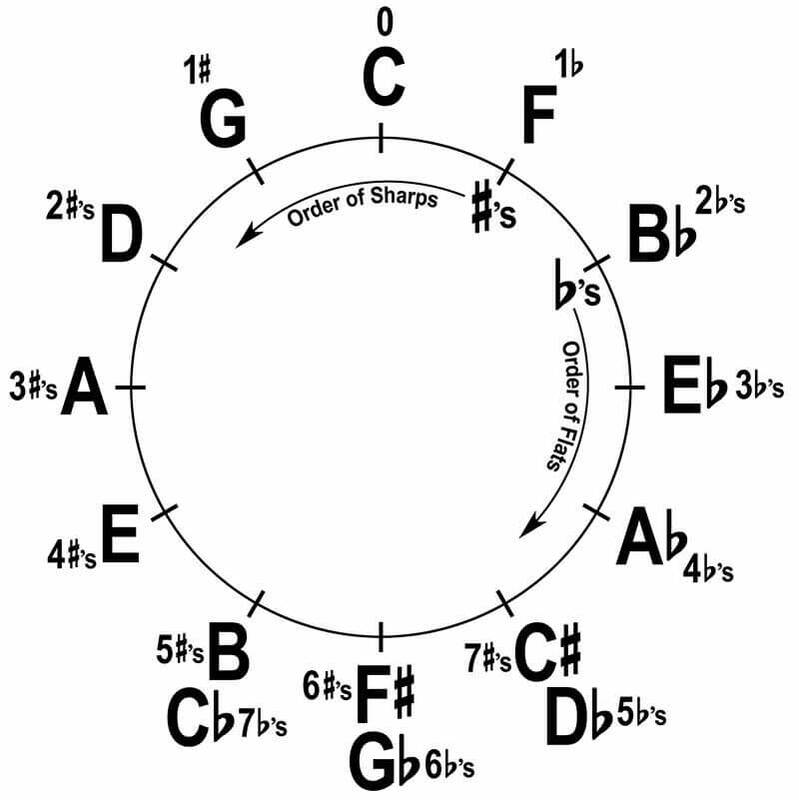 Generally it is presented in the form of a circular diagram that shows the sharps and flats in each key, and how a key works in relation to one another. You can check this out Interactive circle of fifths by Rand Scullard. Here are twelve blues arpeggios related to the twelve musical keys. What's the circle of fourths ? The circle of fourths is also great for practicing scales, chords and arpeggios. It is a great tool to learn about the guitar neck and give the student a solid intuition of chord progressions. While the cycle of fifths moves from left to right, if you move from right to left, then you have the cycle of fourths. So try now to play the six previous blues arpeggio patterns following the circle of fourths. The most prominent, important and relevant way to play blues arpeggios is to play them on a blues progression. First, let's take a basic blues progression in F. Any guitar student must be able to build a basic F blues. It contains only three chords built on the I7-IV7 and V7 degrees of F. Thus, Giving F7 (I), B7 (IV) and C7 (V). Now let's take a jazz, blues progression in the key of Bb7. Please note the descending chromatic progression in bars 7 & 8 using three dominant 7th chords (Bb7, A7, Ab7) to approach G7 at the end of the bar 8. A diminished passing chord in bar 6, a ii V sequence in bars 9-10 and the turnaround (I7-VI7-iim7-V7) at the end. Obviously, we will use blues arpeggios over all dominant 7 chords namely : Bb7, Eb7, A7, Ab7, G7 and F7. Now that you are familiar with the blues arpeggio, try to put it into your improvisations over jazz, blues tunes such as Watermelon man by Herbie Hancock, Blues for Willarene by Grant Green, All blues by Miles Davis, Blue Monk by Thelonious Monk, C jam blues (Duke Ellington), Freddie Freeloader (Miles Davis), Mr P.C (John Coltrane), Straight no chaser (Thelonious Monk), West Coast blues (Wes Montgomery), Tenor Madness (Sonny Rollins). The list goes on and on. This guitar lesson provides four easy exercises with tabs and diagrams to improve your musical skills using tetrad arpeggios.